At least 10 riders had to be rescued from a roller coaster at Daytona Beach when three cars from the roller coaster derailed. According to a representative from the Daytona Beach Fire Department, two people fell from 34 feet in the air and two had to be rescued from a car that was dangling in the air. The front car completely came off the tracks and was left dangling in the air and two other cars derailed. Six passengers were taken to the hospital and the two that fell to the ground were listed in serious condition. The roller coaster track was intact, leaving questions as to how the cars derailed. 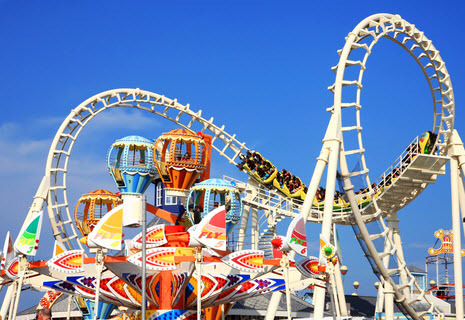 What is Premises Liability and How Does it Apply to Amusement Parks? Premises liability is the term used for laws that determine liability when a particular condition of land, building, or other premises results in injuries. In an amusement park, this can include the general condition of the park, the activities, and the rides. Premises liability recognizes different types of entrants to the land or in the case above, the park, to decide the degree of care that each type of entrant is responsible for. In the case of an amusement park and the people that pay to enter the park, those are considered invitees and the owner or owners of the park are liable for their safety. The owner(s) of the park must maintain the park so it is in safe condition for those who are admitted to the amusement park, whether they were admitted for free or pay to enter. If the owner knows of a condition that could be harmful to those who enter, they have a duty to warn the people that come to the park. Failing to maintain the park or warn of dangerous conditions makes the owner(s) liable for injuries to those in attendance. When it comes to the rides at the amusement park, the owner of the park must make sure that rides are reasonably safe to use. This means that the rides must have adequate restraints, the employees must use proper supervision and follow safety instructions, and the equipment must be maintained and have frequent inspections. If the owner failed to do any of the above, or discarded clear instructions, they have breached their duty of care. However, if the person admitted to the park fails to follow the safety instructions or fails to use the equipment properly, the owner is not responsible for their injuries. Because rides must undergo thorough inspections and maintenance, in the event a ride malfunctions and results in serious injuries like in the news story above, it is unlikely that the owner could claim the accident was a “freak accident” to avoid liability. If you or your loved one has been injured in an accident at an amusement park due to the negligence of the owner or an employee, you may be eligible for compensation for your injuries. An experienced Boca Raton attorney like those at the Leifer Law Firm can help you determine what options you may have under the law and make sure you receive any compensation that you are entitled to. Contact us today for a consultation.